Check out the latest in LED TRAILER lighting. 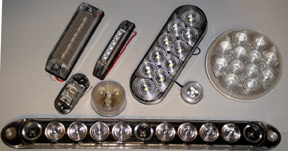 We have a line of clear lens "EURO" look trailer LEDs for most all replacement light needs. Our clear lens oval trailer stop/run lights are very cool with RED LEDs to make a very modern look. Our 15" long light strip is a great center light, or side lights for an enclosed trailer. Check out the Trailer LEDs page and the new EURO LIGHTS section for all of these new lights. We are expanding our options continually to make for better service to our customers.